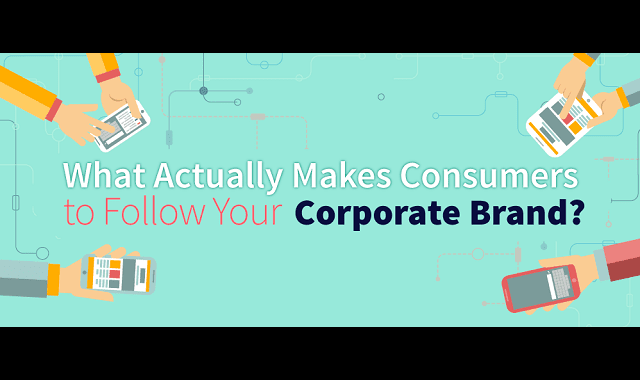 What Actually Makes Consumers to Follow Your Corporate Brand? #Infographic ~ Visualistan '+g+"
Branding is an important strategy to promote your business on every scale. Both startups and large corporations are eager to find an interesting way to promote their brand to masses. Their need is fulfilled by multiple strategic campaigns, including corporate branding and social media marketing (SMM). A positive experience on the web turns your visitor into your potential customer. It is believed that if a visitor engages whether by participating in a contest or by liking the brand on Facebook, he recommends brand to his friend circle. That certainly depends upon his/her web experience. This infographic created by Dubai monsters lays down a handy example of what makes consumer follow a corporate brand.